There are more details on the mixed-use project proposed for the properties on 17th Street between Alton Road and West Avenue, including the Shell gas station site. As Belle Isle Blog reported previously, a development group including members of the Soffer family (think Turnberry) want to build a five-story structure featuring restaurants, retail, parking and high-end rental apartments on the two properties, which would be linked over the Alton Court alley by an overhead ramp connecting the parking garagess. According to the Real Deal, plans call for a 30,699 square foot ground floor with a “prominent” supermarket and the upper levels would include 221 parking spaces, along with 29 residential units. It’s supposed to go before the Miami Beach Planning Board next month, Next Miami reports. If you’ve dreamed of a bridge crossing the Collins Canal to link West Avenue behind Epicure and Ace Hardware with the exciting neighborhood emerging at Sunset Harbor — with its good new restaurants and soon-to-open Fresh Market and reliable Publix — you can wake up soon. Miami Beach is moving forward with its study of the West Avenue Bridge, after approving the spending of $698,000 on planning back in April. On Tuesday, Sept. 13, the city is holding a community meeting to present plans for the project. It happens from 6 to 8 p.m. at the Miami Beach Golf Club, 2301 Alton Rd. Public input is invited. The city has a website set up with maps of the bridge and areas of impact, as well as renderings of what it would look like. 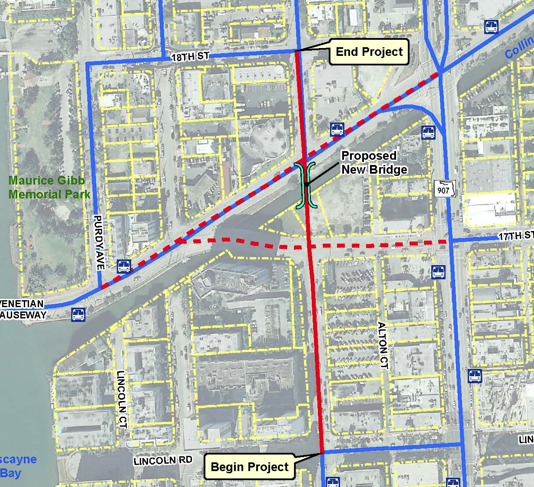 The bridge would make travel simpler across 17th Street and Dade Boulevard between the West Avenue area south of 17 and Sunset Harbor. Currently, drivers and bicyclists either have to use congested Alton road or Purdy Avenue. According to the project timeline, various studies — environmental and engineering — will take place between now and July 2012, and the city would then have to approve the actual construction. The ballpark for construction cost is $5 million. (Thanks to BelleIsleBlog reader CF for the heads-up on the city’s progress). West Avenue dead-ends at the Collins Canal. When we last left Commissioner Jonah Wolfson, he was meeting with residents at Belle Plaza for the Belle Isle town hall. Among the complaints he heard: Epicure had dropped its 10 percent off discount for Miami Beach InCard users, and, what the heck! The commissioner told us he planned to look into the matter, and now he’s sent an email to Epicure owner Jason Starkman. Read it yourself. I have received numerous complaints about your establishment having ended the IN Card partnership with the Miami Beach Chamber of Commerce. I imagine that much of your core customers are not happy. I just wonder why you started this program in the first place if the reason for stopping it was business loss. It seems that you should have been able to project as much. I am very interested in receiving your input. Let me know your thoughts. No changes yet, but it’s a start. Epicure’s address is there. We could write them, too!